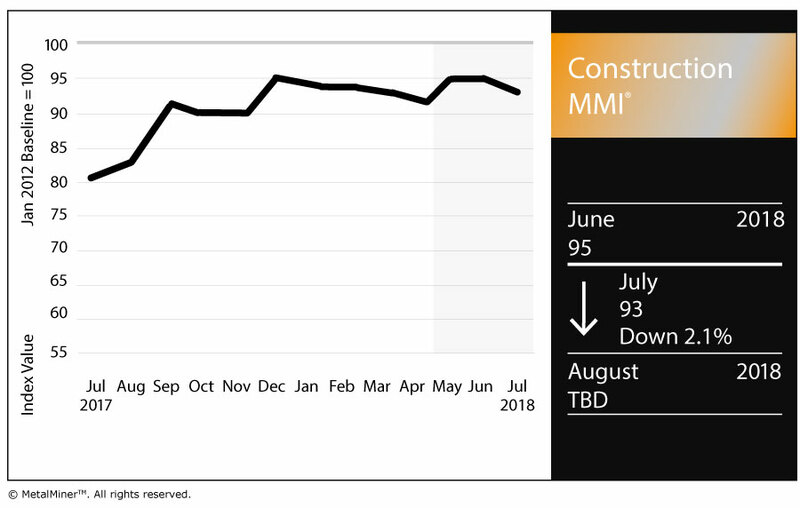 The Construction Monthly Metals Index (MMI) dropped two points, falling for a reading of 93 this month. May construction spending rose 0.4% compared with the revised final estimate for April, according to Census Bureau data released this week. Spending in May hit $1,309.5 billion, up from $1,304.5 billion in April. The May spending estimate greatly exceeded the May 2017 total, rising 4.5% year over year. Meanwhile, through the first five months of the year, spending increased 4.3% compared with the January-May period in 2017. Private construction spending was $1,005.4 billion, or 0.3% above the revised April estimate of $1,002.3 billion. Within private construction, residential construction was $553.8 billion in May, up 0.8% from April. 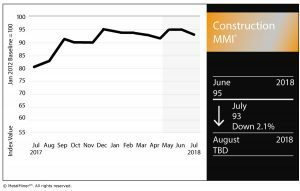 Nonresidential construction, on other hand, was $451.5 billion in May, down 0.3% from the previous month. As for public construction, spending was $304.1 billion, up 0.7% from April. Within public spending, educational construction was at a seasonally adjusted annual rate of $74.3 billion, up 0.9% from April. Highway construction hit $94.6 billion, down 0.2% from April. The Architecture Billings Index (ABI), put out monthly by the American Institute of Architects, once again showed growth in May. The ABI hit 52.8 (anything above 50 indicates billings growth), up from 52.0 in April. This month’s report included survey data from architecture firms that were asked about productivity levels. According to the report, 55% of respondents said firm-wide productivity levels were up by either a little or a lot over the last few years. Meanwhile, only 20% said productivity levels were down in recent years. In terms of realizing greater productivity, 40% of respondents said staff and/or staff training were the biggest factors in “determining changes in staff productivity.” In addition, 22% said the biggest factors were the economy or project workloads. Chinese rebar rose 0.9% to $625.11/metric ton, while Chinese H-beam steel jumped 1.0% to $644.74/mt. U.S. shredded scrap steel picked up a dollar to reach $371/short ton. European commercial 1050 sheet aluminum fell 2.4% to $3,000.12/mt. Chinese iron ore PB fines fell 3.3% to $79.27/dry metric ton.